The Friday afternoon was topped off with a visit to the local boutique brewery pub where we sampled some local ales. A brisk walk around the corner and we were on the way to Settlers where the amateurs outnumbered the locals three to one, but they took it in their stride and dinner was on the way in the blink of an eye. The buffet style meal was punctuated by local Balloon Pilot and all-round Scotsman, Alan Cameron who regaled several tall tales, some of which may have had a little help from the local brew. Dinner was accompanied by local musicians who kept up a lively flow of song and music. way through the weekend. Afterwards a quick registration for the AGM - every current WIA member was presented with a blue voting card - not that we needed to vote on anything in the end, but being prepared is always par for the course. 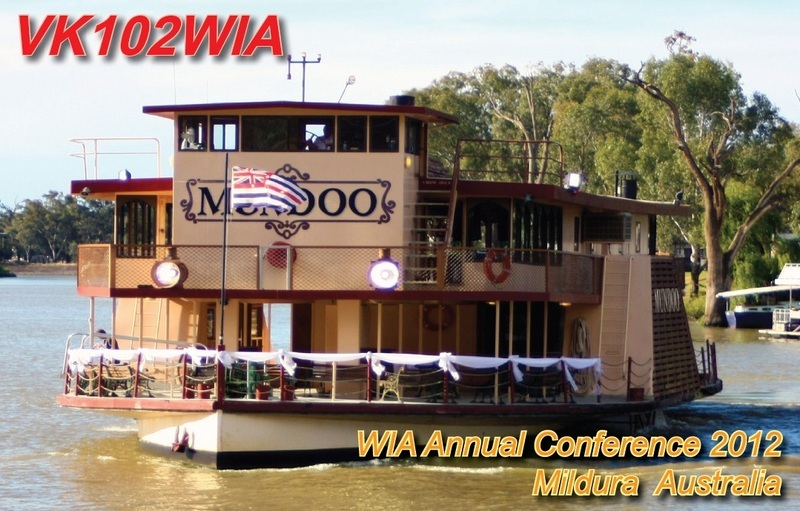 VK3KI, WIA President Michael Owen, ran a tight ship and after opening the AGM celebrating 102 years of the Wireless Institute of Australia at 09:07 and the acceptance of apologies we stood for a minute silence to acknowledge the silent keys who passed in the last year. 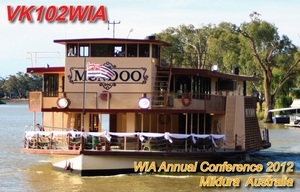 65 WIA members and 55 further Amateurs, two Life Members among them. The minutes of last year's AGM were accepted and the financial report was passed without comment. New Directors were introduced and at 09:13 the AGM was all done and dusted. Next item on the agenda was the annual awards and President's Commendations. was that it should be possible for the club-grant scheme to be used to buy tins of paint because it might well be that this would be the most important thing for a club to spend money on and one member stood to ask for exactly that - having just moved into a hall that needed more than some TLC. During morning tea - which included several nice pastries - several discussions continued on and the topic of promotion of the hobby was discussed. After lunch we had four technical presentations. We saw a demonstration of Amateur TV, saw satellites launched into space, heard about how audio chirps help determine propagation and saw amazing footage and inventiveness with project Horus. Pre-dinner drinks were enjoyed by some, but yours truly was putting together the announcement for the conference next year in VK6 and you'll hear more about that in the news next week. Dinner was accompanied by classical music and a classic speaker who had a lifetime in media and commercial broadcast radio and had many tales to tell about radio in Mildura. For early risers the next morning, there was the opportunity to witness two Horus launches, weather balloons with electronic payloads. One of the launches had a repeater as a pay-load and many amateurs used it to check-in with VK3WIA. station and QSO's were had with New Zealand, VK6 and Russia. At several times signal reports were quite strong but some detective work determined that a few hams decided to make call-backs from the boat - anything for a QSL card. After lunch and a group photo we made our way to the QTH of Noel Ferguson VK3FI who opened up his home and his shack for all of us to be inspired by. A life-time of building is visible in Noel's shack and his attention to detail comes with a dry wit which saw the local bag-pipers come by to annoy the President of the Sunraysia Radio Group. The BBQ was of the same high standard that Mildura offered throughout and it was topped off with a masterfully called raffle, under the auspices of Ray VK3HSR. And that's how it ended, laughing into the distance. What an experience! Next year we'll have to put on a great show to top this one.